I'm having a little fun with tablescapes this week and this is a repost. Once in a while, I check the stats on my blog. 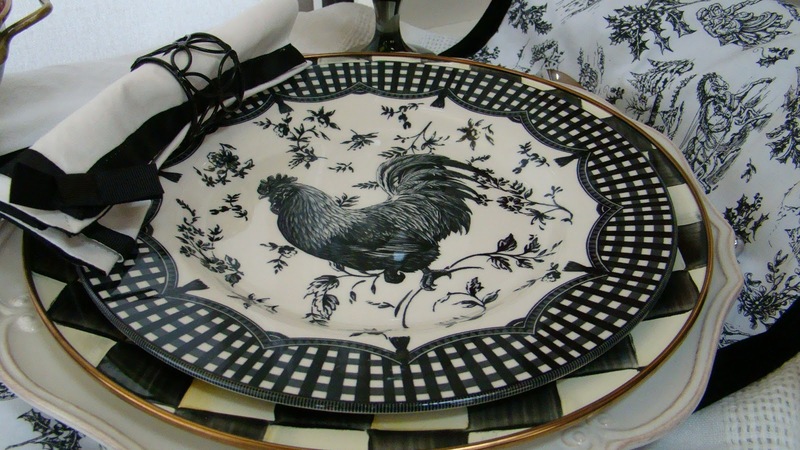 It tells me what is popular, and these rooster plates with MacKenzie-Childs chargers are very popular. The plates have a wonderful scalloped design with tassels. A dear friend recently gifted me with the rooster plates she has collected so now my collection has grown! 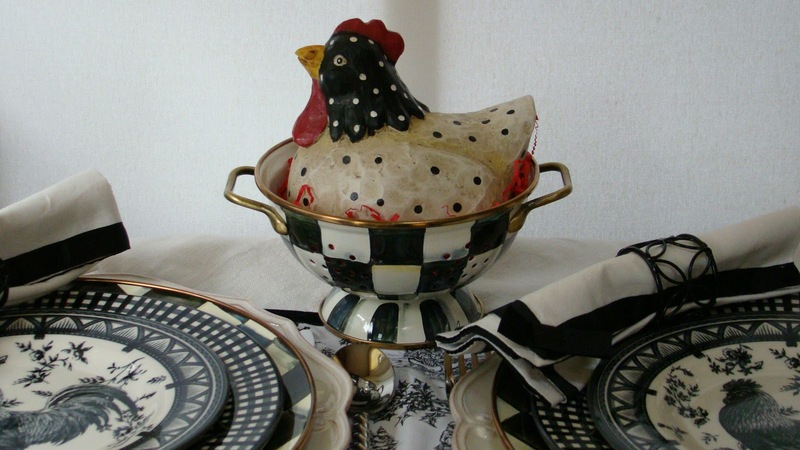 The centerpiece hen is nesting in a MacKenzie-Childs strainer. I have 3 red ones..they really are so cute.. I don't need any more dishes at all..at all at all.. They suit all your MC! I've been trying to downsize. Tea sounds good....I'm sipping blueberry coffee at the moment. The rooster plates go so well with your CC, Debbie. Thank you so very much for the offer to buy and ship them for whomever wants them. They look perfect how you have them set on your table with the hen in the colander. The toile fabric adds the right touch! Thanks Kitty! 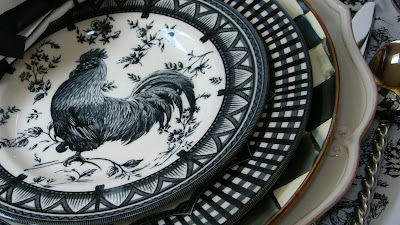 I do enjoy the rooster plates, and they made me smile when I saw them in the shop. I've had many emails over the years about them. I love the toile runner too! Sarah, I will get them for you and email the details. Glad they will be well loved. Love your rooster plates. They are perfect with your MC! Thank you Michael Lee. I'll be popping over to see your new ranch home again soon. Those are gorgeous plates! I hope who coveted them emails you soon - before someone else snatches them up. They set a lovely table!! You're a good egg, Miss Debbie! I hope Sarah is able to get them from you! Thank you Miss Alycia! I was able to get them for Sarah today. 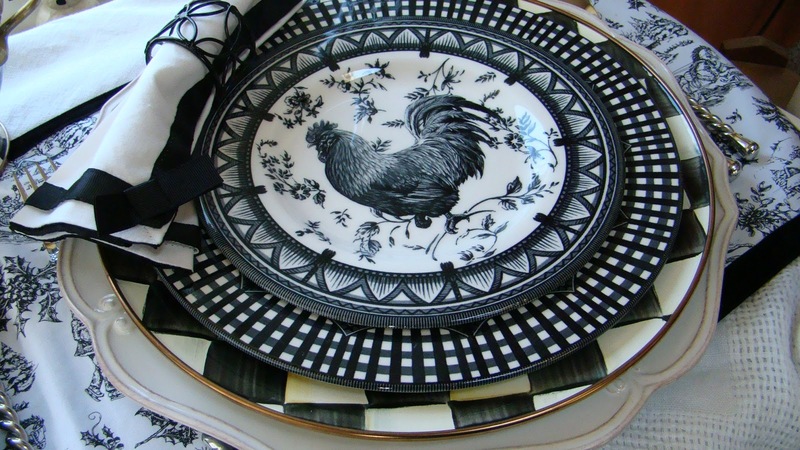 I love your black/white dishes. I have the red set of roosters dishes, mugs, salad plates, small veggie bowls and dinner plates from TJ MAXX. I didn't know they had black/white ones until after I purchased all my red ones. Your tablescape is terrific - thanks so much for sharing. Mary, I love the red ones too and may get them for our cottage. I have a vintage red and white theme, so they would work well. I have the blue rooster plates from TJ Maxx. I only have the plates. I love the black and our TJ Maxx has the black ones often. I think I will have to get a few of the black when they get more in. The blue rooster plates are so pretty too! They are beautiful dishes in all colors I feel. what a darling collection you have going! I have 4 of these and would like another 4. They looked good with your MC pieces! I'll let you know if I find any more Liz. How awesome...normally, I am not much of a fan of rooster and chicken décor, but these are great. The black and white really makes the bird look so much more upscale. Love it! Oh, my....absolutely gorgeous!! How elegant and sophisticated. Lovely. Visiting you from Tablescape Thursdays. Debbie, these reposts are all new and fresh for me, so I really appreciate seeing the post in context. I think I saw the sunflowers (FB?) being used recently, and I like those too, but there is just something about black & white (and roosters!) that I just love. So glad to know you now!